Making foliage wave in a 2D game with wind. Since we are working hard and doing things that could be interesting for some of you (or maybe all :D), we thought it would be very nice to share stuff we’ve been making in a little bit more technical way. You can use these tips and tutorials in your projects and tell us your experience with them, and even suggest us ways to help us improve. We will start with what we call the “foliage waver”. It’s a rather simple shader that will twist and move your plants, leaves and anything you want to be affected by a force like wind, or the movement of the players. We do get knowledge and influence from other people too, and in this case it all started from an awesome post in Unity forums by GambinoInd. Using his example shaders as a base, we modified it to our needs in Degrees of Separation. We simplified it for a use in 2D, added new variables, and introduced rotation of the plant with the waving. Note: We made a nice Unity package with all the code and resources we are gonna create here. You’ll find it at the bottom of this post. //The skew accumulates the force applied over time. //Friction and dissipation makes the plant go back to initial position little by little. //Calculates how much the plant should rotate depending on the force, bounciness and speed. The sprite renderer attached to the object we want to wave needs to use a Material with the shader we created before. 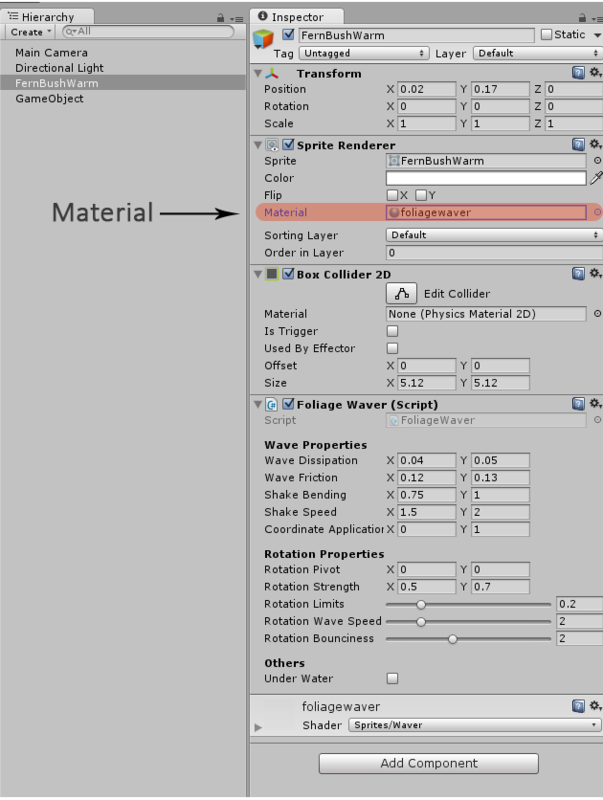 Just make a new material and select our shader from the dropdown in the material’s inspector. Then go to the sprite inspector and drag and drop the material into the renderer component. Wave Dissipation: This controls how long the plant will keep waving after the force is applied. Wave Friction: The bigger it is, the most difficult for the plant to wave. Shake Bending: This controls how much the plant waves. A big number will result in funky moves. Shake Speed: How fast the wave travels. Coordinate Application: This represents where in the plant the wave will be applied. if the min is 0 and the max is 1, it will be applied in the entire plant, but always incrementally from the bottom to the top. If the min is 0.5 and the max is 1, the wave will be applied only from the middle of the plant to the top. Take in account that we are moving vertices, and these are connected, so it is inevitable that the entire plant is moving at some point. this happens also in real life. Rotation Pivot: The pivot around which the plant rotates. You can draw gizmos to see the pivot in the editor. For better results, set the pivot X to 0, and Y a bit below the center. Rotation Strength: How strong the rotation is, always depending on the force applied. Rotation Limits: How far the rotation goes. This number should be low. Rotation Wave Speed: How fast the rotation wave or bounciness is produced. Rotation Bounciness: If the rotation should be constant or bounce a bit. UnderWater: If you want to add waving in plants under water, the wave is different, smoother. Toggle this and it will behave more correctly underwater. The Rotation Wave Speed and Bounciness are two properties that can be considered a bit experimental. Put them to 0 or very low if your rotation is a bit funky. Now, if we did everything correctly and play the scene, our bush should wave. But now it’s just waving constantly because we’re applying a force of 0.2f, hardcoded into the script. WindMachine: Object that throws wind waves with certain frequency. These waves will make foliage move. Player movement: When player goes through foliage, the speed will trigger waving. Weather: We have a global, constant wind that affects the entire scene. This makes foliage wave all the time, but changing strength and direction with a specific frequency. For simplicity here, we’ll skip the first two and focus on the global wind, part of the weather. The Weather Data is a Singleton, a class that will handle things in our game that have one and only one instance. Singletons make our life easier with convenient access to this objects from anywhere, as if they were static classes. Another thing to note is that our wind has a Vector velocity and not just speed, so it can be used in 2 dimensions. In the case of our shader, only the x coordinate of the velocity will be applied. MinMaxFrequency will make the velocity change randomly every ‘n’ seconds, ‘n’ being a random number between min and max frequency. We can tweak our wind component and it will make our bush wave differently! Now you can add all this into your projects and enjoy the breeze!